A huge tornado cut through the Oklahoma City suburbs yesterday mid-afternoon local-time, causing widespread devastation from a track estimated to be up to a mile wide at times. The tornado made a direct hit on the town of Moore, as a severe tornado with winds of up to 200mph and the storm has been given a preliminary category of EF4, the second highest category on the Enhanced Fujita scale. So far reports suggest that at least 91 people, including 20 children have died in the catastrophe event in Moore, with another 120 being treated in hospital. 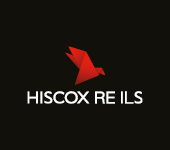 Insured losses within the region devstated are expected to be high, perhaps high enough to impact reinsurers as well. The tornado struck Moore at around 3pm local-time and remained on the ground for approximately 45 minutes. The damage caused by the tornado has been compared to that caused by a tornado in 1999 which devastated the same area. Reporters on the scene yesterday said that they thought that the damage from yesterdays storm could be more extensive than the 1999 tornado had caused. The last few days have seen the tornado risk in the mid-west U.S. states rise dramatically and Moore was not the only town struck in the area. The town of Shawnee, Oklahoma was struck by a tornado on Sunday which destroyed a trailer park. 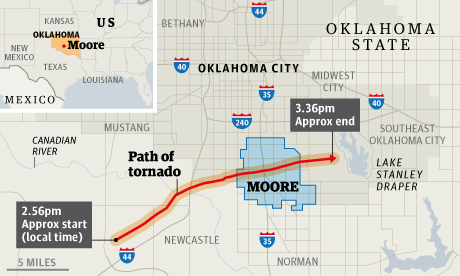 The graphic below shows the track of yesterday’s tornado through Moore, Oklahoma. 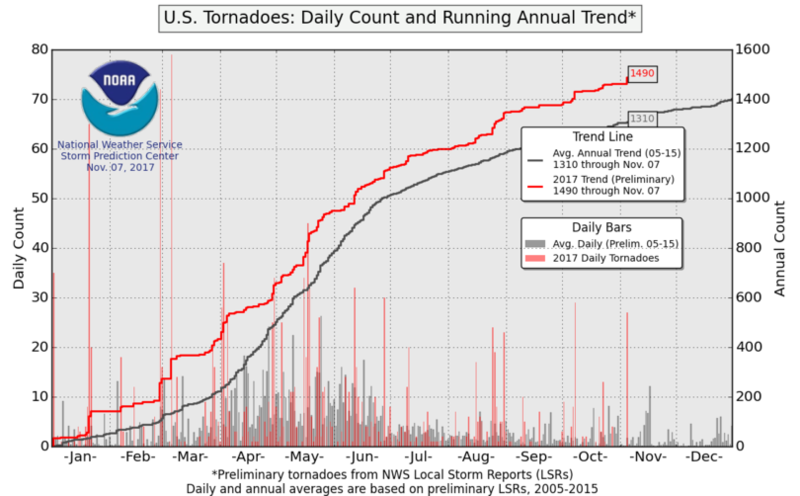 The 2013 U.S. severe thunderstorm and tornado season had got off to a slow start this year, with tornado rates still running well below the long-term averages. However storms such as yesterday’s catastrophic tornado in Moore will see insured losses climb steeply. Given the extent of the damage shown on television footage it has to be assumed that this Moore tornado event will be designated a catastrophe event by Property Claims Services (PCS). PCS categorise an event as a ‘PCS identified catastrophe’ if it is thought to have caused at least $25m in damages and to have affected a significant number of policyholders and insurers. That is certainly the case here. It’s too early to speculate as to the impact on insurers, reinsurers and any fall-out for exposed catastrophe bond tranches. Although unlikely to seriously impact the cat bond market, the event does appear to have the potential to cause losses high enough to qualify for certain aggregate tranches of cat bond notes. We will update you when insured loss estimates are available from this event in a few days. The charts below show the 2013 tornado season trends to date. 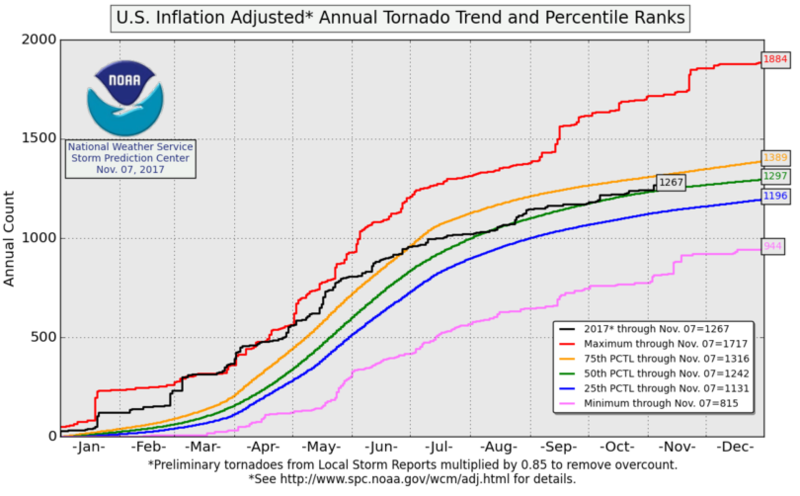 As you can see the season is running well below average at the moment, however we are entering the peak of the season and tragic events like the one in Moore yesterday show that nobody should ever be complacent about U.S. severe thunderstorm and tornado risk.